The SMA community at Blackrock Road gathered on Tuesday, 6 September, to celebrate the Golden Jubilee of the Ordination of Fr Michael Cahill SMA. Two of his sisters, staff members from the Main Office and St Theresa’s Unit and the local SMA community gathered at 11am for a concelebrated Mass, led by Fr Eddie O’Connor. In his homily, Fr Eddie highlighted the fact that, despite the serious ill health of the last nine years, Michael is a man with trust in God. He said: “In the words of St Paul, “My grace is enough for you: my power is at its best in weakness” and Michael’s response, even if he never articulated it was the same as Paul’s, “For it is when I am weak that I am strong”.” Read homily here. Afterwards, a presentation was made on behalf of the community to a very dear and cherished member of the Society of African Missions. 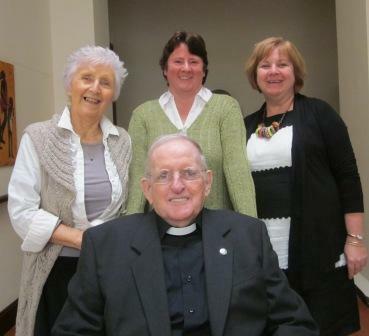 Michael is pictured here with, from left, Kathleen Hickey, Patricia Nagle and Mairéad Hickey, with whom he worked for many years in the Main Office, Blackrock Road. Fr Michael was a missionary in Nigeria, in the dioceses of Ondo, Ibadan and Ilorin for 35 years. During those years he was also called on to serve in leadership roles in the Society, a sign of the esteem in which he was held by his fellow SMA’s. His hospitality was appreciated far and wide. Okitipupa, Ondo, SMA House Ibadan, Holy Family parish in Ilorin – wherever Michael served there was always a vibrant Catholic community and a welcome for all.